A mother and her four-year-old son have been flown to hospital after a tree fell on them in a park and zoo. The Welsh ambulance service said the four-year-old suffered serious head injuries at Manor Wildlife Park, St Florence, near Tenby, Pembrokeshire. The boy's mother also had head and other injuries. Both were taken to Morriston Hospital in Swansea. The park is owned by television interior designer Anna Ryder Richardson and her husband Colin MacDougall. After the alert was raised, the fire service said firefighters from Tenby lifted the tree off the woman and her son before they could be treated by ambulance crews. Mid and West Wales Fire and Rescue Service say two crews from the town were sent to the scene at 1133 BST after the Welsh Ambulance Service asked for their help. Crews arrived about 10 minutes later and both left the scene after about an hour-and-a-half. A statement read: "A tree is believed to have fallen on a woman and young child and as a result both have been seriously injured. "Fire service and ambulance attended the scene, and the casualties were conveyed by air ambulance to Morriston Hospital, Swansea." 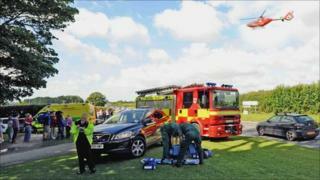 The ambulance service said the woman had a suspected broken leg, arm and pelvis in addition to a head injury. Dyfed-Powys Police said they were jointly investigating the incident with Pembrokeshire council and the health and safety team. Police later said the woman was aged 28 and from Llanelli, Carmarthenshire. Anna Ryder Richardson and her husband, Colin MacDougall, later released a statement which read: "We are absolutely devastated by this and our only concern is for the little boy and his mother. "Our thoughts are with them and their family." It is home to a variety of exotic animals including zebra, bison, rhino, lemur, gibbon and llama. A television programme called Anna's Welsh Zoo is due to start on ITV Wales next week.